In an age when consumers are willing to communicate with their favorite brands by sharing images on the visual web (selfies to show off new shades, sunsets to cap off a relaxing day at a resort), the question of ownership has left even the most progressive marketers asking: How do we source our fans’ photos in a scalable, legal way? UGC isn’t a new kid on the block. But with all the uncertainty that surrounds rights management and user permissions, brands across every vertical are still hesitant to knock on its door. Whether you’re currently leveraging fan images or not, UGC has already become an integral part of not only social, digital and ecommerce strategies for major brands (Urban Outfitters, Rebecca Minkoff, Wet Seal and Design Within Reach, to name a few) but of the buyer journey itself. Your fans are now taking the time to voice–albeit, visually–enthusiasm for your products. To nurture this relationship, the least you can do is let them know they’re being heard. Rights management tools can help you to better collect, moderate and share UGC simply and seamlessly on your website, to your social channels and anywhere else you see fit. But until recently, many brands have struggled to integrate this process into their marketing workflows. Of course, there’s the issue of obtaining user images in the first place. But even then, it becomes a matter of organization, implementation and impact. For brands to truly derive value from UGC, these factors need to be accounted for as well. From rights to relationship management. Curalate’s Yes! Tags, the newest addition to our marketing suite, streamlines this workflow and makes rights management for your fans’ photos just a comment and hashtag away. Sourcing and securing the right to your fans’ images are only part of the equation though. Let’s not forget that, as the initial point of contact between most brands and their customers, Yes! Tags (and any other rights management tools) are also an introduction. To leave a good impression and to truly delight consumers, choose your words wisely. Say hello. Thank them for their awesome submissions. And, above all, celebrate the fans who have made an effort to publicly celebrate you. Brands don’t get personal with fans nearly as often as they should, and yet simple engagements and social shout-outs can help you relate to your customers more deeply, create a shared sense of excitement, and drive brand advocacy that endures. 1. 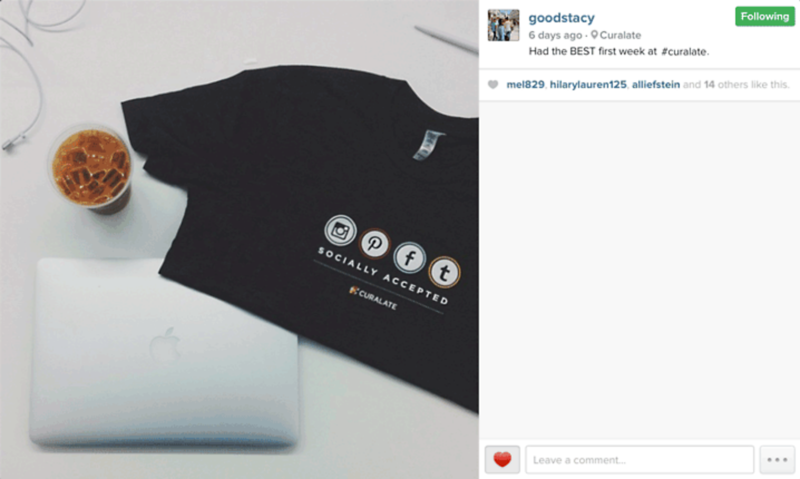 A user posts a photo with your brand’s hashtag. 2. The photo appears in your Curalate moderation queue and awaits approval. This is a private feed that can only be seen in Curalate. From there you can approve these images by clicking the check mark here! 3. Once approved, a comment requesting permission for use is automatically posted to the user’s photo. This message and “Yes! Tag” are 100% custom and will be pre-defined by your brand. In this example, Curalate uses #CuralateRocks. 4. The user has replied with the appropriate Yes! Tag and the photo appears in your “Approved” feed. It’s now available to share across your digital channels. Additionally, we automatically log all of the appropriate user data and submission records to keep your legal team happy! Images that have not yet been replied to will appear under “Rights Pending”. After 15 days without approval, these images will appear under Rejected Images. Finally this image will automatically appear in your live Fanreel or moderated Canvas. Rights management tools can be a gateway to more meaningful fan engagement. The brands that win big will be those that view these unique interactions as opportunities to establish relationships with, and tip their virtual hats to, some of their biggest, most dedicated customers.